Salesforce - the new integration that includes all the features listed in this article. Salesforce (Legacy) - the old integration that has limited features and will be discontinued soon. If you haven’t connected it before, then please disregard it and choose instead the new “Salesforce” integration. The new Salesforce integration gives you the possibility to easily sync all your customers to Retently, automatically import new contacts and export NPS data for further processing in Salesforce. But the real power of the integration lays in the ability to choose what data will be exchanged between both services, and the possibility to segment your Salesforce audience and assign it to NPS campaigns. Before connecting the integration you will be asked to authorize our app in your Salesforce account. 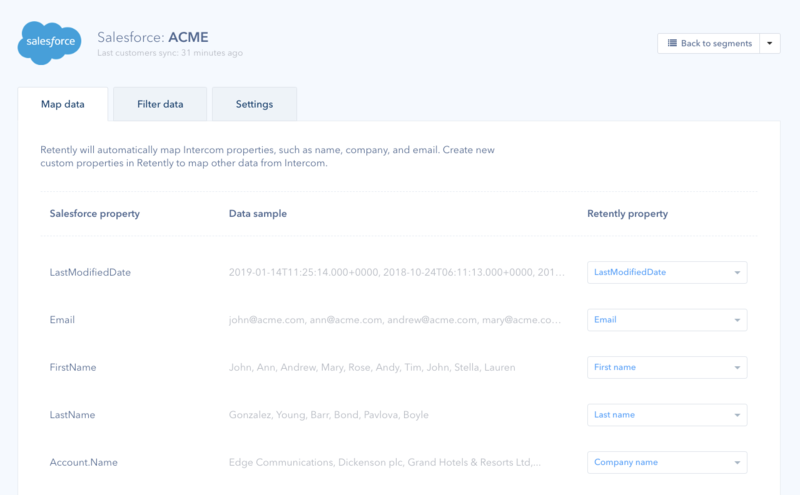 All you have to do is to add our IP ranges to your network access section, letting your Salesforce account know that you are trusting our app and allow it to access your contacts’ data. To authorize Retently, log in your Salesforce account and access the Setup section. From the left sidebar, access Administer > Security Controls > Network access. Click on the New button to add new Trusted IP Ranges. Finally, click on the Save button and review the Network Access settings. Once you have completed this step, you can go back to your Retently account, access the Integrations page, click the Connect button next to the Salesforce integration, and then hit the Next button. You will be redirected to your integration’s main page. It may take a while to refresh your data and finish the setup. Custom segments created in Retently using Salesforce properties. Create a new segment button: Create a new custom segment, using properties from Salesforce, and applying additional filters. Here, you can adjust the integration settings and configure the data exchange between Retently and Salesforce. These settings will apply to all your lists and segments. Export NPS data to Salesforce: Choose what NPS data will be automatically imported to Salesforce and applied to your contacts. It can be the NPS score only, or the score and feedback, or you can choose to skip the NPS data import. To be able to receive NPS data in Salesforce you will have to create a couple of custom fields. You can find a tutorial on how to create the fields here: https://help.retently.com/salesforce-integration/automatically-export-nps-data-to-salesforce. When a customer is unsubscribed in Salesforce: Decide what should Retently do with a customer once unsubscribed from Salesforce messages. Your contacts have a list of properties in Salesforce, such as name, email address, country etc. Retently will map some of these properties automatically, whilst others will have to be mapped manually. If you have a property in Salesforce that is not listed in Retently’s default list, for instance: “Signup date”, you can create a custom property and map it to the existing one in Salesforce. You will be using these properties when creating custom Salesforce segments, or when filtering the audience for your NPS campaigns. On this tab, you can decide how duplicates are handled by Retently. We recommend keeping the Update option, which will make sure that your customer data is synced between Salesforce and Retently. 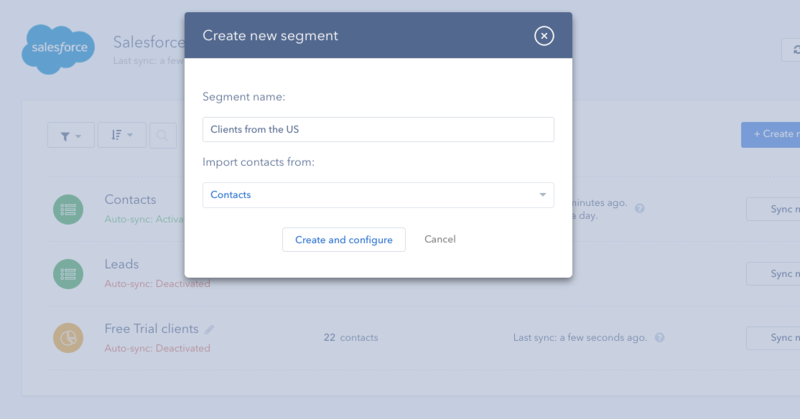 A pop-up will ask you to give the segment a name (which you can rename later if needed) and choose whether should the contacts be imported from Contacts or Leads. Defining the contacts source is important because each segment is created based on the customers and properties from a specific main list. In Salesforce, by default, there are two main lists: Contacts and Leads. You can also select the “Salesforce segment” property, which will give you the possibility to choose one of the segments you have already synced.